One day I will be remembered as the greatest scientist that the world has ever known and so it is my duty to mankind to record my thoughts the future generations are able to study the progress of a genius. At eleven years old Benjamin Tooth knows he is destined for greater things than his humble home can offer. He will go to university and become a master of the sciences, he will marry the most beautiful girl and be happy. Or at least this is what he believes, and when he discovers secrets about his life and is surroundings, it would seem he is on his way to greatness, even if there are some pit stops on the way. 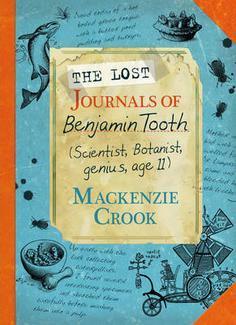 I was lucky enough to obtain a copy of Mackenzie Crooks two novels from Faber and Faber recently, the first to be published was The Windvale Sprites and this, The Lost Journals of Benjamin tooth is a prequel of sorts to that. I decided to read them in order of publication and so this was the second, but by no means was it any less of a great story! The story follows Benjamin Tooth from when he is eleven and is split into three parts. Each part is separated by a lapse in the journals of around 5 years and it takes us through to when Benjamin is around 22 years old. Each of the breaks come after specific events happen in Benjamin’s life and I really liked how the story was broken up in this way. There are things early on that lead to Benjamin’s discoveries later on and if, like me, you read The Windvale sprites before this then you know of some of the things to come,I was excited for this as I really wanted to know how Benjamin got from the sweet young boy we meet at the beginning of this story to the possibly insane man he is shown to be in the other book. I loved the setting of the story and how it showed the age in which Benjamin lived. I am unsure to how reliable a reflection of life in these times the book is but for a humorous tale of a wannabe scientist you can’t go wrong with this book. The characters are interesting to say the least but the main focus is on Benjamin. I loved Hettie and was intrigued by Farley Cupstart and Benjamin Senior but they are really the only other characters who stood out. I was a little upset that certain questions that were raised didn’t seem to get an answer and really you only have Benjamin’s hypotheses for what went on but maybe that opens up the series for another book? Mackenzie Crook obviously has a great talent in writing and drawing, matching that of his acting and even if you just pick up this book because he was Gareth in The Office the. I promise you will have fun reading it. The Lost Journal of Benjamin Tooth took me back to an easier place and I was transfixed by the world Benjamin tooth lived in. The drawings of the Sprites bring them to life and I really felt like I was seeing them for real too. These books will be a great addition to any youngsters bookshelf and I hope you agree. The Lost Journals of Benjamin Tooth was published on November 7th by Faber and Faber. My copy was sent from the publisher in exchange for an honest review.